Recent discoveries of alluvial gold deposits in Northeast Niger have led to an increased prospection activity of artisal miners in the Air, Djado and Ténéré Tafassasset area. 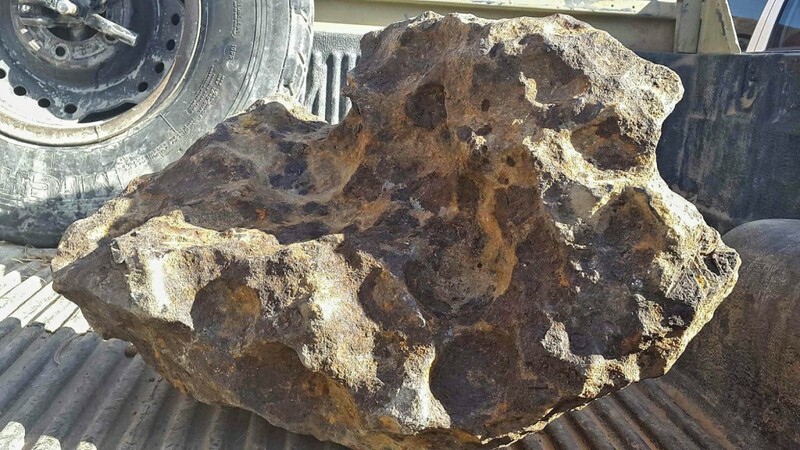 Within the course of 14 months, from January 2015 to February 2016, mining and prospection activity resulted in the discovery of at least seven masses of meteoritic iron with a total weight of 606 kg, with the largest mass weighing ~320 kg (status of 28 February 2016). 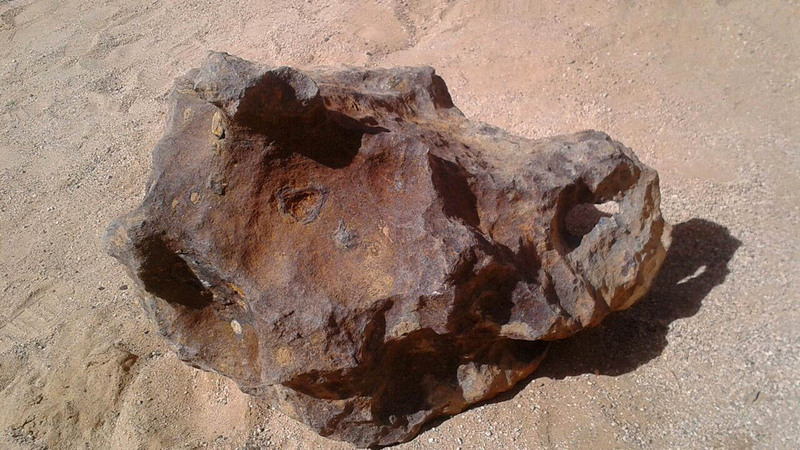 In January 2015, the find of an iron mass of ~32 kg was reported to the corresponding author by a source in Agadez, Niger (Source A). In this work we use the designation “NEN for “Northeast-Niger”” followed by a consecutive number for the masses discussed (non-official, field designation only). The iron has approximate longest dimensions of 32 x 22 x 10 cm and the shape of a triangular wedge. A hook-shaped extension is protruding several cm from the shortest base of the triangle. Several bowl-shaped concavities, as well as some smaller and deeper hollows appear on the two largest surfaces and on the pointed edge. 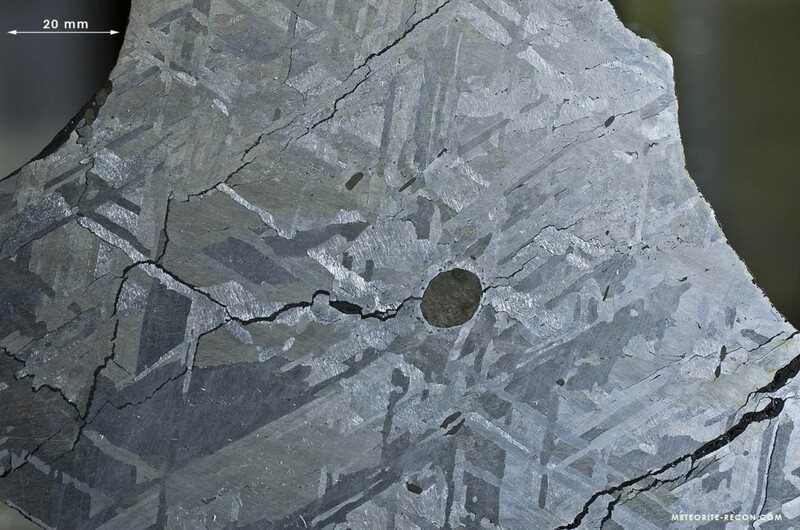 In at least three different points on the iron’s surface mineral inclusions are weathering out of the metal groundmass, one is partly filling a nozzle-shaped hollow. With some certainty, these inclusions can be addressed as the iron sulphide mineral troilite (FeS). Troilite in meteorites forms veins or lenses ranging from a few mm to several cm along taenite crystal boundaries, and since it is less resistant to thermal ablation is often completely excavated during atmospheric ablation (Ashley 2011). The complete surface of the mass is covered with terrestrial (hydr)oxides and shale. Give the hyper-aridity of the general find area since at least 7.4 ka BP, both the degree of soil etching and the total lack of caliche and desert varnish points to an extended period of sub-surface weathering that lasted until excavation. 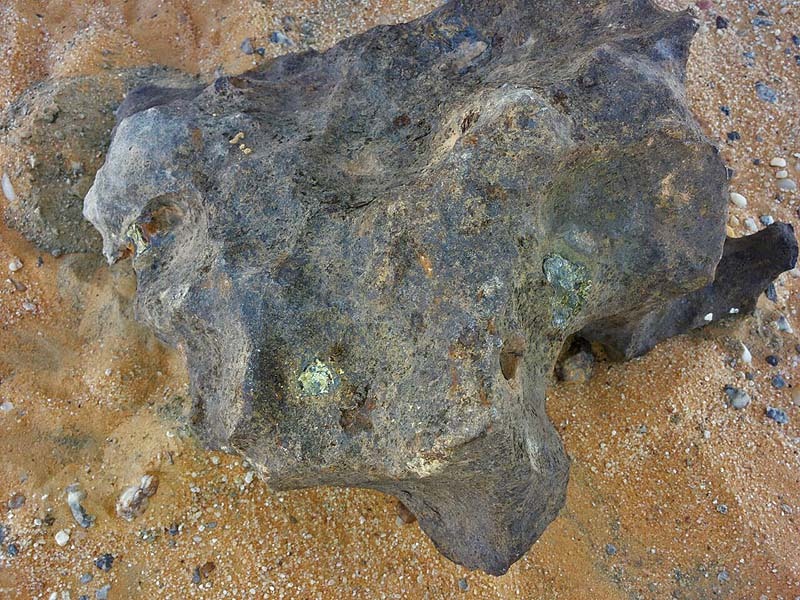 The overall shape of the iron is that of iron meteorites exposed to prolonged terrestrial weathering and a result of both selective ablation during atmospheric descent and corrosive interaction in situ. 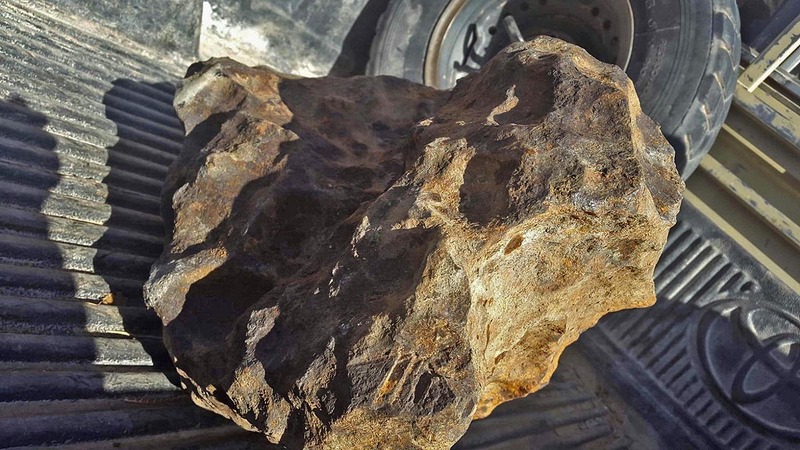 Upon request, the owners of the mass reported that the iron had been found covered in the soil while metal-detecting for alluvial gold in the Tafassasset. No concrete location info was given. Some time later, the iron was reportedly exported to China (Source B). 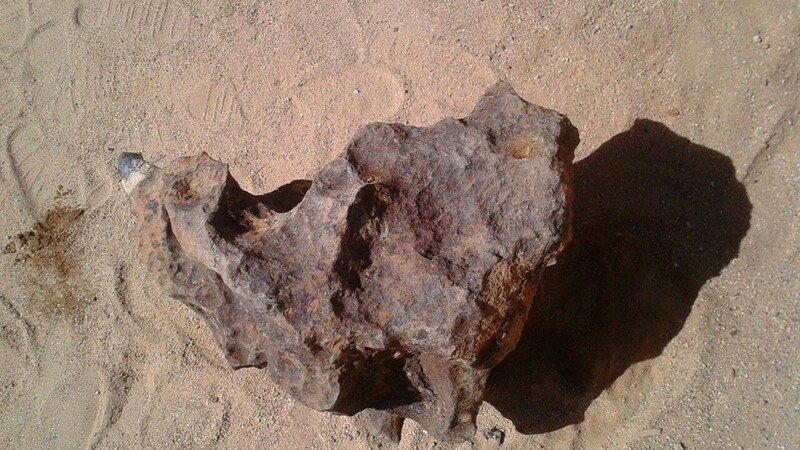 According to a second source in Agadez, Niger, in November 2015, in the vicinity of the first find, a second iron mass was found (Source B). 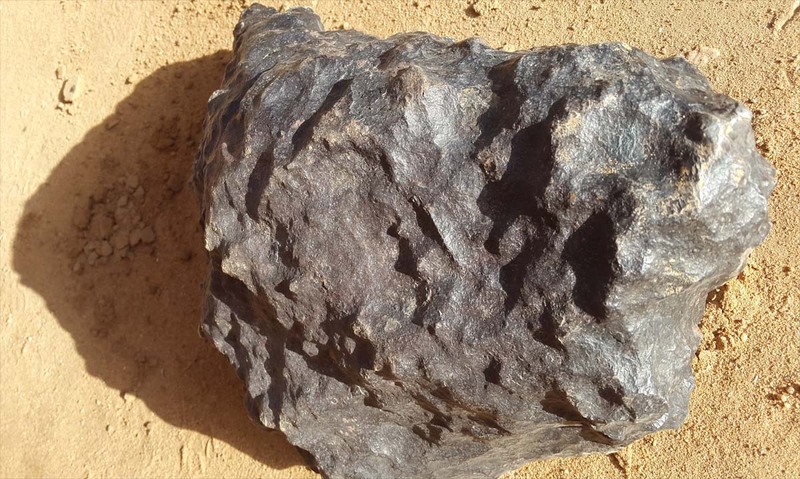 The iron was subsequently purchased by the author and on December 5, an ownership title was issued to the author’s correspondent by the Agadez Regional Director of Mines and Industrial Development, followed by an export permit by HANEA (2015), dated December 29. 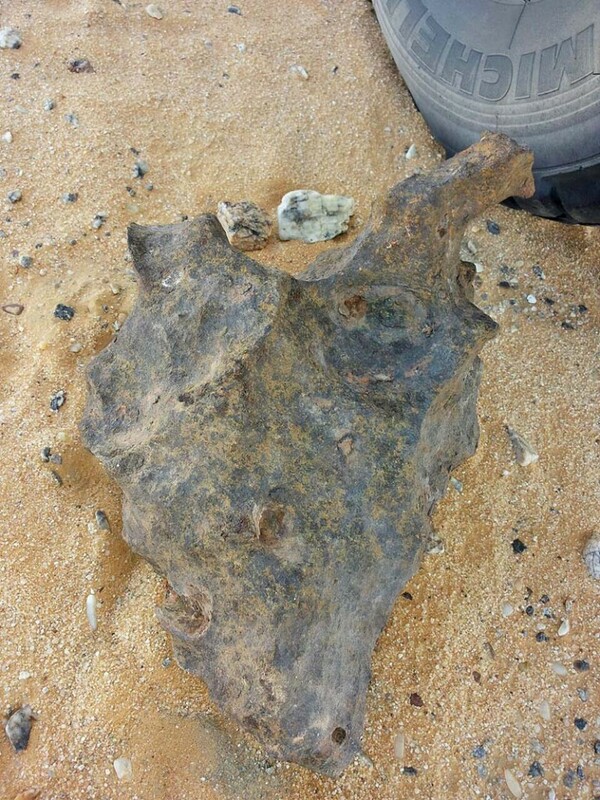 In February 2016, samples for analysis and classification were removed, which are currently scheduled for analysis and classification. The 52.0 kg mass has longest dimensions of 39 x 25 x 18 cm and has the shape of a longitudinally split cone with the cone section showing minor concavity while the opposite surface is distinctly convex. The complete surface shows numerous regmaglypts measuring 1 – 3 cm across and 1 – 1.5 cm deep. On the convex surface, the regmaglypts are generally better preserved with distinct outlines and clear ridges, while on the flanks and opposite side, the alteration has progressed more intensively. Several larger bowl-shaped hollows with longest dimensions of 6 cm and depths of 2 – 4 cm are apparent on the concave surface and flanks. On the convex side, close to the truncated base, an oval FeS inclusion measuring 3 cm across is visible on the surface. While fusion crust is not observed, the complete surface of the iron is coated with a thick layer of dark brown desert varnish, giving the meteorite a dark, almost black appearance. In places, the desert varnish covers patches of thin limonitic crust, the surface itself, with small exceptions, however is inert with no visible traces of active oxidation. Several protruding edges of the meteorite display corrasion by saltating sand grains (Lorenz 2014), albeit on a moderate scale. Because desert varnish forms over thousands of years on exposed surfaces only (Dorn 1981, Thiagarajan 2004, Perry 2006), NE 002 must be a surface find. Polished sections display a Widmannstätten pattern of a medium octahedrite with a mean kamacite bandwidth of ~1.00 mm + 0.3 mm. The kamacite has subboundaries and displays several generations of Neumann bands. In the sections observed, Schreibersite and graphite is absent. FeS is present in the form of rounded and bar-shaped inclusions ranging from 2 – 20 mm across the longest axis, partly surrounded by thin swathing kamacite. 0.1 – 1 mm wide fractures penetrate the meteorite along the kamacite lamellae and are filled with terrestrial oxides, otherwise the interior weathering is very moderate. Fusion crust is absent, with the exception of a partially ablated and recrystallized FeS nodule in the rim zone of a cut section, which includes a trapped melt pool. In the sections studied, heat-affected α2 zone is mostly absent, indicating a surface loss of the meteorite due to terrestrial weathering of at least 2 mm. No precise find location was given for the specimen other than the information that it was found by Tuareg people looking for gold in the Tafassasset (Source B). Shortly after the report on NEN 002, a third mass was reported in Agadez, Niger, in mid December 2015 (source B). A request for the weight was answered with the information that ‘two men could not carry it’. Some days later, the iron was transported to a scale in Agadez, weighed, and the mass was given with 202 kg. Estimated longest dimensions are 60 x 40 x 28 cm. The lenticular meteorite has one slightly convex surface that displays well preserved regmaglypts, and a heavily sculpted and more weathered opposite surface comprising of deep, partly intersecting bowl-shape cavities. 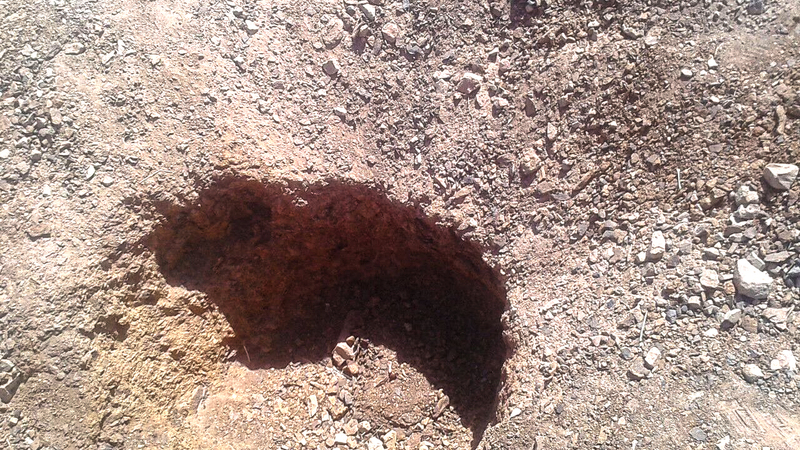 Most hollows are of circular or oval shape and measuring 5 – 12 cm across at largest dimensions, while approx. 2 – 5 cm deep. The mass appears to display a slight degree of orientation, with the convex surface representing the breastside, and the cavernous surface the trailing part. The convex front displays a lead colored pocket measuring ~3 cm across, which is most probably a weathered troilite inclusion still in situ. Corrosion has progressed between the metal groundmass and the inclusion, creating a millimeter sized gap between it and the surrounding metal. On the opposite surface, near the broader of the narrow edges, acidic corrosion has exposed individual crystallographic planes of the octahedral Widmannstätten pattern. Three orientations of kamacite plates intersecting at approximately 60° angles are visible, indicating that the revealed surface is parallel to an octahedral face (Frost 1965, Ashley 2010, 2016). 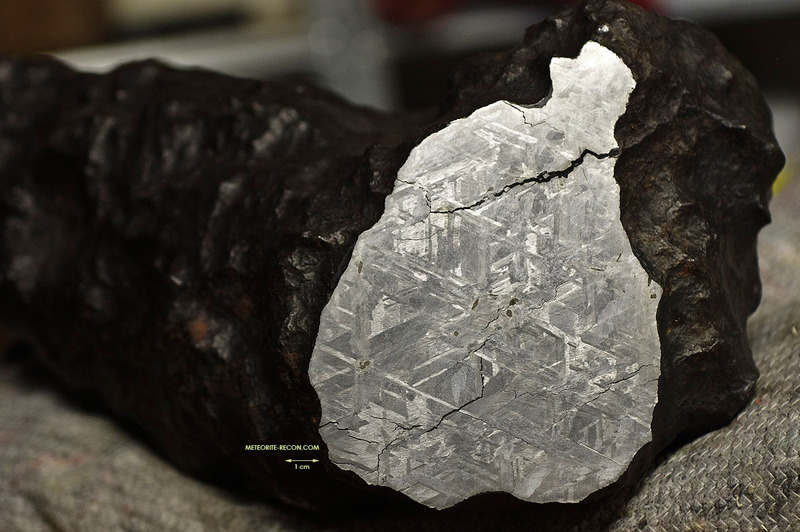 In addition to providing objective proof of the iron’s meteoritic origin, the revealed crystallographic pattern also gives away the octahedral structure of the meteorite. Based on the photos, the bandwidth cannot be determined, the general dimensions of the structures, however, do not rule out correspondence to those of etched sections of NEN 002. On the trailing side, NEN 003 is coated with a dark red rusty and partly flaky scale of terrestrial oxides, indicative of a find position completely below the surface. The regmaglypted top surface shows a somewhat brighter oxide coating, presumably controlled by the presence of carbonate deposits. No trace of recent sand abrasion or wind polishing is observed, providing further indication for a complete and prolonged embedding of the meteorite in the sediment. As in the previous cases, requests for additional find information remained unanswered and no find location other than “found during the search for gold with metal detectors in the Tafassasset” was given. 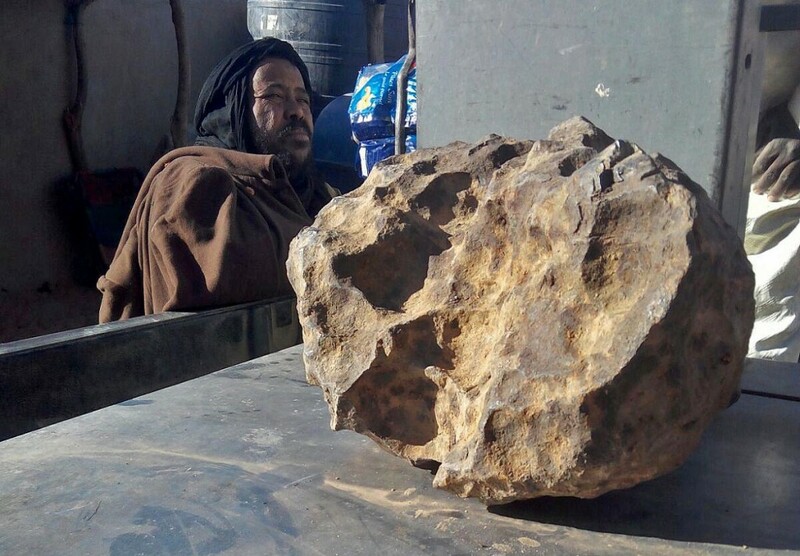 In early January 2016, a fourth meteorite find from the Tafassasset gold fields weighing some 300 kg was shown in Agadez. 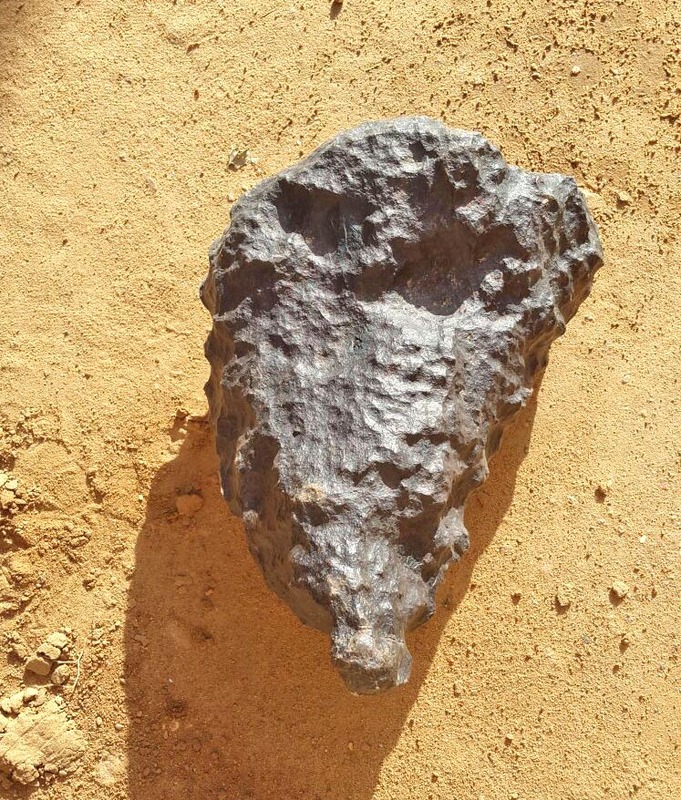 Reportedly, the meteorite was found ‘between Air Mountains and Djado’ while metal detecting for gold (Source A). On the 1st of February, new photos of NEN 004 surfaced from Bordj Badji Mokhtar in southern Algeria, to where the mass had been transported together with NEN 003 in order to market it (source C, source D). Depending on the respective source, the weight reported for NEN 004 varies between 320 and 364 kg. The provided photos however, leave no doubt that all three sources refer to the same mass. NEN 004 is comprised of one large (a) and three smaller masses (b, c, d) for which no individual weights were given. The largest mass (a) has approximate longest dimensions of 66 x 40 x 32 cm and an irregular, twisted pear-shape, with tapering shoulders and a narrow stern. Regmaglypts are abundant on the meteorite, partly well preserved but also with more intense alteration. At least three cm-sized troilite inclusions are weathering out of the groundmass, and several large and undercut hollows indicate that atmospheric ablation and the resulting shape was at least in parts controlled by the presence of other troilite inclusions. The longest surface of the mass is dominated by a keyhole-shaped aperture measuring approximately 10 x 3 cm. As the regmaglypts surrounding the hole show only little surface alteration, the feature was likely formed by the initial ablation during atmospheric entry, although post fall corrosion may have further widened the opening. A flat, featureless surface orthogonal to the longest axis of the mass is suggestive of one or several kg-sized fragments that have detached from the mass along a cubic or preexisting fracture plane. Because the edges of both the plane surface and the adjoining perpendicular surfaces are relatively sharp with no ablative alteration present, it is to be assumed that the detachment was caused by terrestrial weathering in situ, perhaps aided by violent recovery efforts. While it was stated that fragments b, c, d were found ‘near’ a, unfortunately no information was given in which way they were related, as they could well be weathering fragments of the bigger mass (a). NEN 004 (a) is coated with loose brown oxide shale on the lower half and a thinner and lighter colored oxide layer on the shoulders and stern end. Both layers are indicative for a sub surface weathering environment, the former of a deeper embedding below the evaporation zone, the latter of a position closer to the surface. Another notable feature of NEN 004 (a) is a bitt-shaped protrusion on the stern end, the neck of which shows a bright band of caliche that stands in stark contrast to the top, which is coated by dark desert varnish. In arid environments, caliche coatings on rocks form below the evaporation zone, which, depending on grain size and quality of the soil components, is usually 10 – 100 mm below the top soil surface. 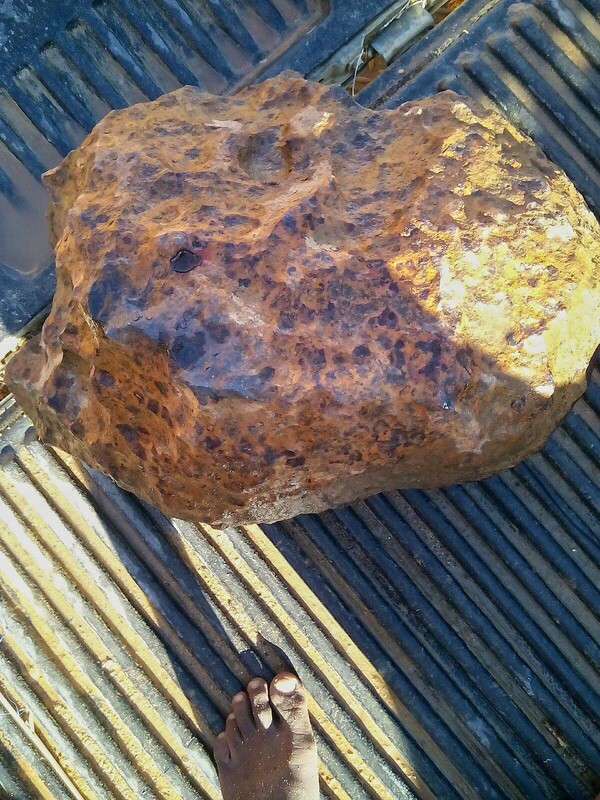 Thus, the band of caliche indicates the dividing line between exposed and embedded portion of the meteorite. The distinct desert varnish on the top of the protrusion is a clear indicator for a prolonged weathering above the soil horizon of the exposed portion (Dorn 1981, Perry 2006). The smaller masses b, c, and d show surface features similar to a, with remnant regmaglypts on the largest piece, borehole-like cavities on two of the masses and desert varnish bordering caliche bands on the smallest and middle specimens. 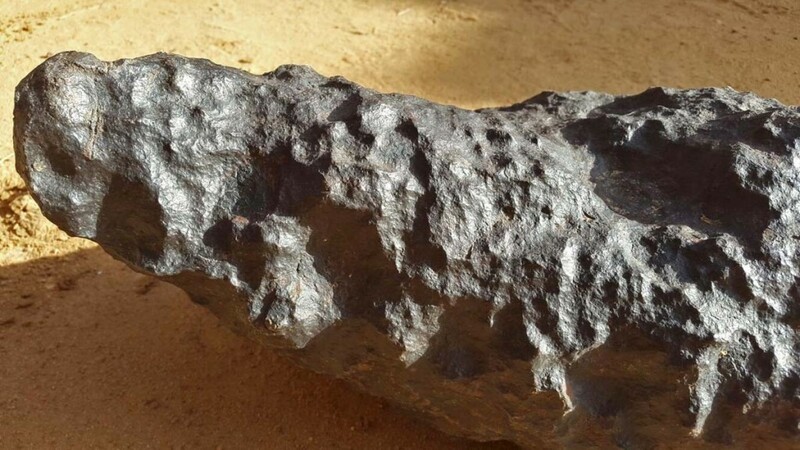 In February 2016, NEN 003 and NEN 004 were both offered for sale by middlemen from Southern Algeria to a number of meteorite dealers from Morocco, and later to individual collectors internationally (source C, source D). Both masses NEN 003 and 004 had previously been transported to Bordj Badji Mokhtar in southern Algeria. 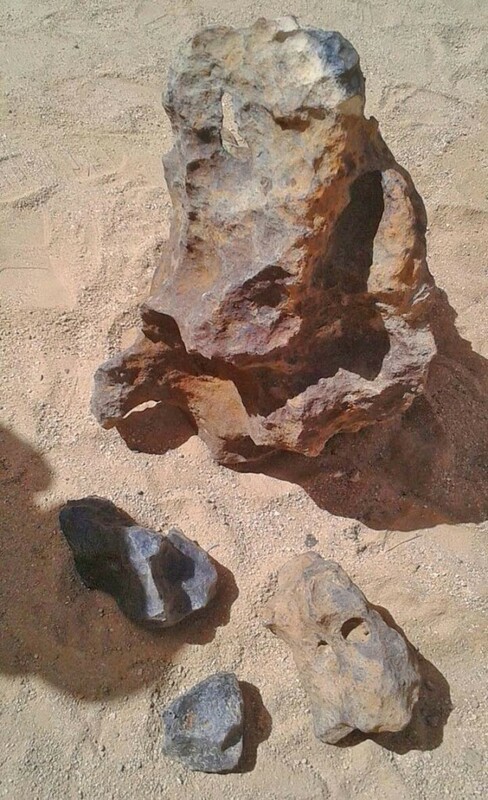 While on its first appearance in Agadez, NEN 004’s find location was said to be “between Air Mountains and Djado”, a new request for information to the dealers now offering NEN 004 from Algeria, was answered with two different find locations. One claimed their origin in southwest Algeria, and one in northeastern Mali. Source D, marketing NEN 003 and 004, claimed to know the find location of NEN 004. While the source confirmed that 003 was discovered in Niger, it also claimed that 004 was from Mali. In the 1st week of February 2016, a correspondent was dispatched by the author to evaluate these claims, and together with the alleged finder a trip was made from Badji Mokhtar to a ~230 km-distant site in northern Mali. At the spot (19°53’54.00″N; 0°41’6.00″W), an excavation pit was shown to the author’s correspondent, photos were taken and a video was recorded. The alleged find site is in the Kidal district of Mali, ~1080 km west of the closest recent prospection area in Niger (Mt. Ibl Massif), and ~ 1,350 km west of the Djado Plateau. If the site is the true find location of NEN 004, the distance would exclude a pairing with masses from Northeast Niger. While the dimensions of the pit roughly fit those of NEN 004, shale or rust flakes were absent in the walls of the hole and in the excavation. Yet, the location in the center of a Holocene wadi cannot be excluded completely by morphology and texture of NEN 004. Wadis, even in the hyper arid climate of northern Mali, are subject to occasional torrential rainfalls and devastating surface runoffs (Moawad 2015). 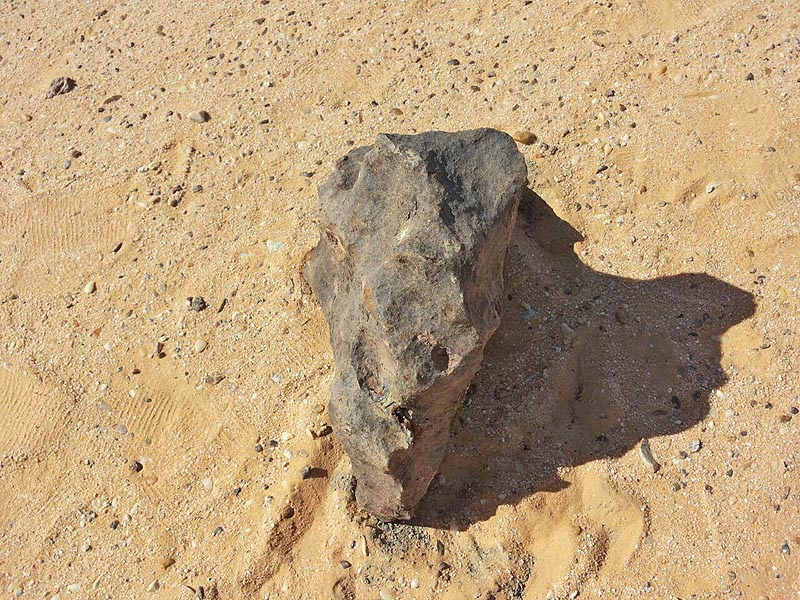 While these involve intensive mechanical abrasion of surfaces exposed, which is contradicted by NEN 004s partial coating with well preserved desert varnish, the visible soil profile and angular debris from the excavation suggests low transport rates in the unarmoured ephemeral gravel bed since deposition (Reid 2009). 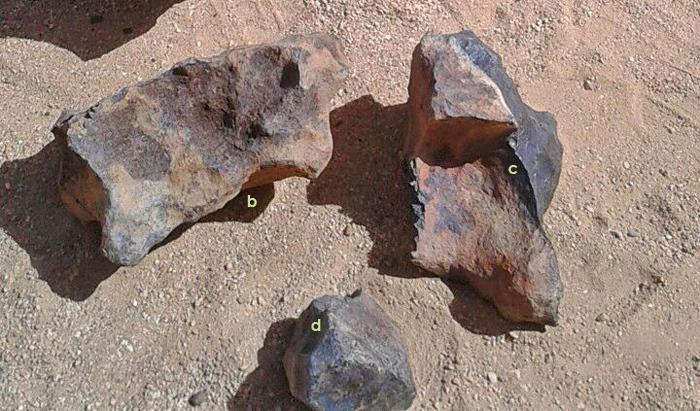 In summary, the evidence gathered at the site remains inconclusive and must be considered insufficient to prove an origin of NEN 004 outside of Niger. Yet, pending comparative analysis, it can not be ruled out that NEN 004 (a-d) represent a different fall event.